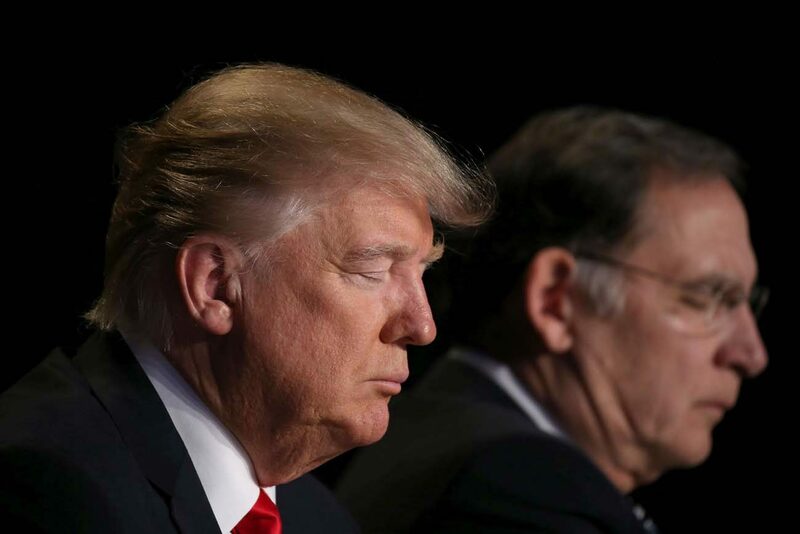 WASHINGTON (CNS) – “Spiritual success” is a more accurate measure for the United States than wealth, according to likely billionaire President Donald Trump in remarks Feb. 2 at the National Prayer Breakfast in Washington. “That is why I will get rid of and totally destroy the Johnson Amendment, and allow our religious representatives to speak freely without fear and without retribution,” Trump said. The amendment, attached by then-Sen. Lyndon Johnson to a 1954 bill, bans federally recognized nonprofits from making political endorsements. “Freedom of religion is a sacred right, but it is a right under threat all round us,” said the president. In his speech, Trump alluded to the executive memorandum he issued Jan. 27 that bans refugees hailing from seven majority-Muslim countries — Syria, Iraq, Iran, Sudan, Libya, Yemen and Somalia — for 90 days. His action suspends the entire U.S. refugee resettlement program for 120 days. He lauded the keynote address given by the Rev. Barry Black, a Seventh-day Adventist who is chaplain of the Senate. The speech was so good, he told Rev. Black, “I’m going to appoint you for another year, the hell with it.” Chaplains are appointed by their respective house of Congress. Disappointed that you would publish this. Trump has never ever shown any behavior or conduct that reflects that statement. His total lifetime goal was and is”money”. And he measures success as a leader by economic standards only, trade,jobs, money. No one believes he has any spiritual grounding. Looks at his actions & statements in totality.